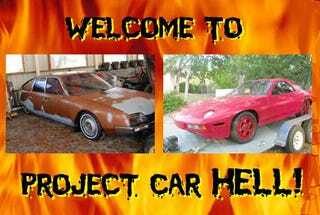 PCH, Franco-Prussian War Rematch Edition: Citroen CX 2000 or Porsche 928? In a stunning upset, the Borgward Hansa wagon handed Germany a one-sided victory over the Peugeot 304 in our most recent Choose Your Eternity poll. With France long reigning as the world's lone HyperGalactic PCH OmniPower, we would be remiss if we didn't give the French a shot at prying the oil-leaking, stripped-fastener-thread PCH CryptoChampion trophy from the Germans, in order to prove that the Borgward's victory wasn't just some one-shot fluke. That's why we're rolling out some Hell Project heavy artillery today, with a pair of undeniably cool- yet just as undeniably nightmarish- machines vying for long-term residency in your Garage Of Torture. It wouldn't be fair to break out the H-bomb of French Hell Projects (the Citröen SM), because we're fairly certain that nothing on the planet can beat the SM in a Project Car Hell matchup. But how about the Citröen CX? The early CX has many of the features that made the SM so wonderful and terrible, but with the added bonus of having been manufactured by a company in complete financial shambles (and with the involvement of both the French and Italian governments). So head on down to lovely Plant City, Florida, and hand over $2,500 for this 1975 Citröen CX 2000 (go here if the ad disappears). The seller doesn't mention anything about mechanical condition, because it's totally unnecessary; you know this car doesn't run! All we get from the seller is "4 cylinder cinline,its standard with red interior seats and holds up to five people," which leaves a whole lot to your darkest imagination. But maybe it will fire right up, the hydropneumatic suspension will leap to the proper height, and you'll roar off into the Plant City sunset with a Hell-free car experience... but that ain't the way to bet. We all know that Porsche engineers don't compromise performance for any reason, including the sanity of the mechanics who will one day work on their cars. So if long-suffering (yet well-paid) wrenchmen Hans und Günter have to sweat out 72 hours of labor (using all manner of single-purpose, Porsche-only tools) in order to replace some tiny component buried beneath a fiendish labyrinth of impossible-to-reach fasteners... well, if that's the way to make the car perform 0.0019% better, that's exactly how Porsche will do it! And the 928 might be the purest expression of that philosophy, with its engine compartment completely packed with one of the most complicated V8s that ever made a veteran mechanic weep with frustration. And it's not just the engine- the whole car is a lunatic monkeypuzzle, and it will drive you mad. Of course, all is forgiven when you actually get to drive your 928, but getting an affordable one to that point takes some work. Nothing you can't handle, though... right? Right! So come on out to Redding, California, and peel off twelve Benjamins for this running, driving '81 928 (go here if the ad disappears). Yes, just $1,200 for a running 928! It's not perfect; the seller admits that it "nees some luv." We can see evidence of some family strife in the car's description ("bought it to fix up with my boys but they think it is ugly i say they have no class, anyway here it is"), so here's your chance to swoop in and grab this jewel before the boys reconsider. Hey, did Porsche paint those wheels at the factory?